PHILADELPHIA--(BUSINESS WIRE)-- Comcast, the nation's largest Internet service provider, today announced the launch of its newest Xfinity Wireless Gateway that gives customers the nation's fastest wireless speeds with the most coverage throughout their connected home. 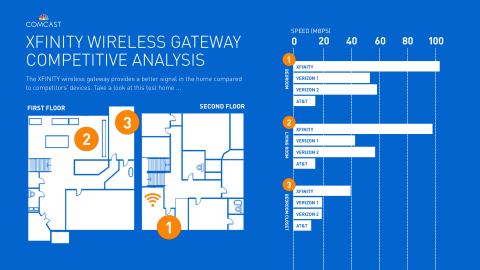 Unlike similar devices offered by other Internet service providers today, the Xfinity Wireless Gateway is the first to leverage emerging wireless technologies that enable customers to experience faster speeds and better performance over their home wireless network. Now everyone can get online and do more on their devices all at the same time. Comcast also announced it has boosted speeds nationwide for two of its most popular Xfinity Internet speed plans, Blast! and Extreme 50. Specifically, the Blast! tier increased from 25 Mbps to 50 Mbps downstream and from 4 Mbps to 10 Mbps upstream. Extreme 50 went from 50 Mbps to 105 Mbps downstream and from 15 Mbps to 20 Mbps upstream. The new Xfinity Wireless Gateway has begun its national rollout and will be made available for the same rental fee as Comcast's standard equipment. The article Comcast's New Xfinity Wireless Gateway Powers the Nation's Fastest In-Home WiFi with Unmatched Speeds and Broadest Range originally appeared on Fool.com.